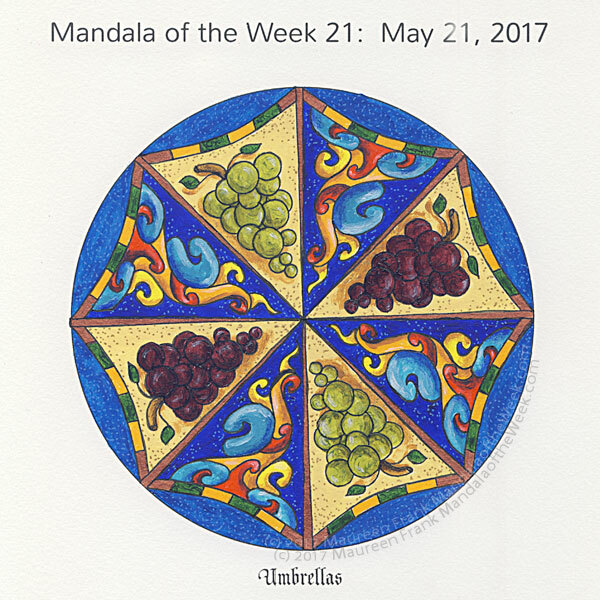 I present my coloring/painting of this week’s Mandala of the Week: Umbrellas (from Sunday’s MotD post). I like how this one turned out. When I see the idea in my head I often wonder how I’m going to make it look as good as I see it and then it turns out even better than I expected. I love the “Tuscan” look of the grapes in between the playful, colorful mod spirals. It would be so cool to have a patio umbrella that looked like this. I may have to paint this someday. I used Holbein, Golden, and M. Graham acrylic paints with Golden Matte Medium, a black ink pen to re-outline the design, and uni-ball signo gel pens. “The umbrella won’t stop the rain, but it will help you to get out during rainfall. As well as confidence is not going to guarantee your success, but it will give you the opportunity to achieve it…” ~ Eyden I.